If you’ve been following the Adira Facebook page recently, you’ve seen photos and videos from any number of activities and events that we provide for our residents and patients. Whether it’s a monthly birthday celebration, morning coffee talk, Zumba or a holiday party, we are never lacking for fun at Adira. All that fun, however, doesn’t simply appear. Not by a long shot. The vibrant activity calendar, which enriches the lives of our residents and patients, is lovingly crafted by our new Director of Activities, Helen O’Brien. For Helen, working with seniors has been a lifelong passion. While growing up in the Bronx, she would spend countless summer evenings sitting outside and listening to the seniors tell stories about when the Grand Concourse was all farmland or their experiences performing in Vaudeville. Her first recreation job was at 17 years old at the Hebrew Home in Riverdale. Since Helen’s arrival at Adira last month, we’ve seen an increase in the different types of activities that are offered. 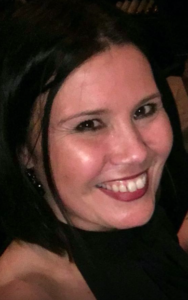 She works diligently to provide a diverse array of community based programs that engage the residents and patients. Welcome to the Adira family, Helen. We can’t wait to see what unique events you come up with next. 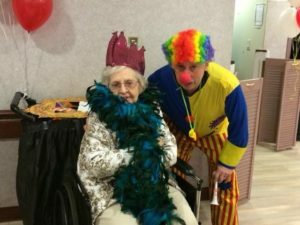 We have a plethora of activities that take place every week here at Adira at Riverside but our favorite events are those that celebrate our residents. 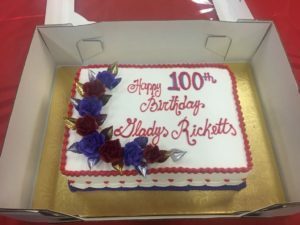 Residents like Gladys Ricketts who recently turned 100 years young! We celebrate all of our patient and resident birthdays with monthly parties but milestones of this magnitude call for an extra special shout out. Gladys came to our facility in 2015 and has been a vibrant member of the community ever since. We know that she enjoys helping others, loves a good cup of coffee (or two) and she really loves dancing. However, with one hundred years of life under her belt, there is obviously more to Gladys’ story. I had an opportunity to speak with Rev. Hynes, Gladys’ guardian and one of the ministers at the Church of God in Yonkers, where Gladys has been an active parishioner for many years. He gave us a look at more of Gladys’ story. Gladys was born on December 24, 1917, in Jamaica, West Indes and immigrated to the United States in the early 1960’s. 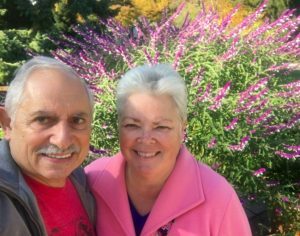 Over the years, she became a U.S. Citizen and spent decades working in the healthcare field as a Certified Nursing Assistant. 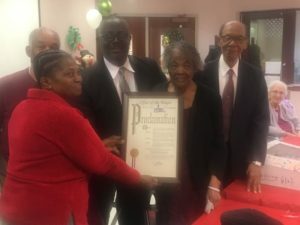 As a retiree and widow of Christian faith, she remained a dedicated and active member of the Church of God in Yonkers, serving in many offices of the church. In addition to being church secretary, she sang in the choir and was a devoted prayer group leader. We were lucky to celebrate her 100th birthday with her but we weren’t the only ones. 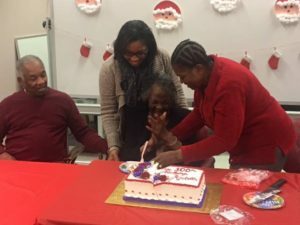 On December 23rd, along with a dozen friends from her church, Gladys was awarded a proclamation from the City of Yonkers Mayor’s office. Congratulations, Gladys! We are lucky to have you with us and look forward to celebrating 101! If you were to walk the halls of Adira at Riverside Rehabilitation on any given Tuesday, you would likely see the smiling face of Tony Martelli. Given the pep in his step and the warm welcome, you might mistake him for the family member of a patient, an administrator or even a member of the nursing staff. It would be an understandable assumption given his friendly, welcome to our home demeanor but he falls into none of those categories. Tony is Adira’s most dedicated volunteer. Adira may not be Tony’s home but he considers it a home away from home and has volunteered here every week for the past several years. When I asked why he chose to dedicate so much of his precious retirement time to volunteering, his answer was rooted in personal experience. Both of Tony’s parents spent their last days in nursing homes and, to put it simply, Tony wanted to give back. A Yonkers resident for 42 of his 64 years, Tony is a retired Teamster and Labor Supervisor with the Yonkers Sanitation Department. Although, calling him ‘retired’ seems like a misnomer. 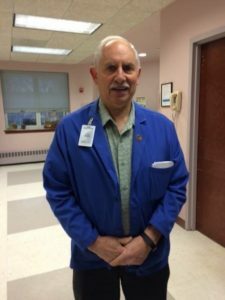 In addition to volunteering at Adira, he works at Costco three days a week and is heavily involved with the Holy Name Men’s Society at St. Bartholomew’s church, his local parish. No moss grows here. Tony is more active than many non-retired individuals. The positive impact Tony has at Adira is evident in the warm welcome he receives from the residents, patients, and staff. His energy, smile, and dedication are infectious. However, Tony admits that it benefits him too and he’s not alone. According to a report from the Corporation for National Community Service, older Americans who volunteer, frequently live longer and report less disability. Tony sees his time spent with the patients as not only helpful for them but also for their families. Many people are unable to visit their loved ones as often as they would like and knowing that people like Tony spend time with them is a priceless comfort. A staunch Catholic, Tony makes it a point to attend the wake of any resident he has befriended and the hugs he gives out at Adira, are shared there as well. When Tony isn’t engaged in one of his many “retirement” activities, he enjoys traveling the world with his wife of 39 years, Ann Marie, and his beautiful daughter, Laura Ann. While Tony has received many honors and recognitions during his career, his is most proud of the Home Town Hero Award which was given to him by the City of Yonkers, naming August 3rd Tony Martelli Day. Tony may be a City of Yonkers Home Town Hero but he is a hero to many at Adira as well. If you’d like to join Tony and volunteer at Adira or at our sister facility, Sprain Brook Manor Rehab, please email Sara Humphreys, Director of Marketing and Communications at shumphreys.sprainbrook@gmail.com or call 914-721-3954.